2nd Annual Maine Striper Sessions – Thanks to all! Thank you to all who came out on March 15th to support the 2nd Annual Maine Striper Sessions, a folk-rock concert to help raise money to conserve Maine’s marine resources at Port City Music Hall. 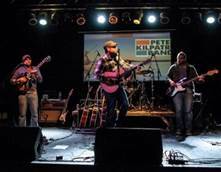 There was a terrific turnout (over 300 tickets were sold) and everyone enjoyed listening to the music of The Pete Kilpatrick Band and Ryan Wimbish. Special thanks to these musicians who volunteered to help send CCA-Maine’s message to study, clean up and protect our precious marine resources. VHB, Vanasse Hangen Brustlin, Inc. Rob Evon, owner of Port City Music Hall, so kindly donated the venue for the second year and was presented with a CCA-Maine lifetime membership as a special thanks for his contributions. The brainchild for the concert came from CCA board member Adam Taylor, who came up with the idea while jigging for mackerel two summers ago. Thanks to all involved in making this goal of bringing Mainers of all outdoor passions and pursuits together.